Score voting (sometimes called range voting) is a single-winner voting system where voters rate candidates on a scale. The candidate with the highest rating wins. For comparison, consider ratings systems from site like: Internet Movie Database, Amazon, Yelp, and Hot or Not. 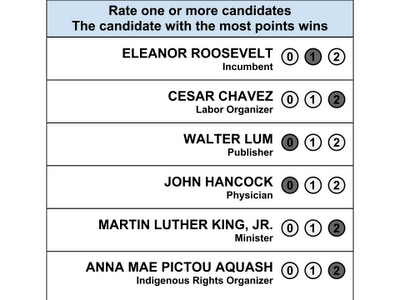 Variations of score voting can use a score-style ballot to elect multiple candidates simultaneously. Technical notes: Simplified forms of score voting automatically give skipped candidates the lowest possible score for the ballot they were skipped. Other forms have those ballots not affect the candidate’s rating at all. Those forms not affecting the candidates rating frequently make use of quotas. Quotas demand a minimum proportion of voters rate that candidate in some way before that candidate is eligible to win. What would the ballot look like? Below we have two different Score Voting ballots. The one on the top uses a 0-9 scale. On the bottom is a simplified version with a 0-2 scale. Voters score each candidate on the ballot. These ballots can be used with modern election machines. CES co-founder Jan Kok, an engineer, demonstrates this here. Note that this is not an endorsement of using computers to count votes. What is the difference between score voting and approval voting? Both score and approval voting are cardinal voting systems. Cardinal systems use utility expressions that do not involve ranking. Voters are also permitted to have a say on all the choices. Approval voting is a simplified form of score voting. Think of a scale with two levels of expression versus one with more levels. When voters only use the extremes of the scale, then score voting reverts to approval voting. Data from a 2007 French study strongly suggest that many voters will use the middle of the scale as well. And to the extent voters use the middle of the scale to vote more honestly, Score Voting provides a better outcome than Approval Voting, on average. (See Bayesian Regret). Score voting, like Approval Voting, doubles the winner utility compared to both Plurality and Instant Runoff Voting. This conclusion considers the strategic voting we see in real life (See Bayesian Regret). What about score voting's use and progress? See our progress page here.